Many of us have heard the discouraging statistics: half of all marriages in the United States end in divorce. And for those of us who are Christians, there was doubly discouraging news: the divorce rate among Christians is the same as everyone else. But Shaunti Feldhahn, marriage researcher and author of For Women Only and For Men Only, calls these statistics bogus in her new book (with Tally Whitehead), The Good News about Marriage: Debunking Discouraging Myths about Marriage and Divorce (go here for an article Feldhahn wrote about the book’s subject matter). The actual divorce rate has never been close to 50 percent. It is significantly lower and has been declining over the last thirty years. Most marriages aren’t just so-so. The vast majority are happy. The rate of divorce in the church is not the same as among the non-churchgoing population. It too is significantly lower. Remarriages aren’t doomed. A significant majority survive and thrive. Most marriage problems aren’t caused by big-ticket issues, so being in a marriage, or fixing a troubled one, doesn’t have to be as complicated as people think. Little things can often make a big difference. How could people have gotten that 50 percent divorce rate so wrong? 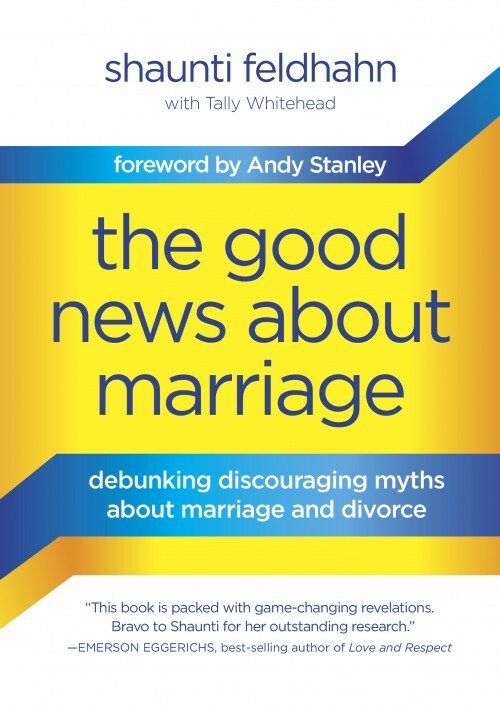 Feldhahn and Whitehead give a detailed response, but the short version is that the 50 percent divorce rate has always been a projection of where researchers think things are trending, not actual figures. I found this book to be very encouraging, and I hope its message finds a wide audience. People need to know that their efforts to have healthy marriages are not in vain, and that most people really do make it through the rough patches. Also, the more I thought about the book’s message, the more it made sense. A few years ago, when my pastor and I were discussing the claim that the divorce rate in the church is the same as everywhere else, he said (and I’m paraphrasing) that the claim doesn’t pass the smell test. In his experience, putting Christ first in a marriage DOES make a difference, and it IS possible to save marriages that are in trouble, no matter what statistical trends may say. Now we know that the broader statistical trends were not as accurate as we thought—and that’s good news for marriages.